I-exceed: I-exceed is a fintech company that is powering the digital transformation of financial institutions worldwide including some of the largest tier I global banks. Appzillon, the flagship product of i-exceed, consists of a unique combination of Appzillon Digital Banking and Appzillon Digital Platform. Appzillon digital banking is a suite of pre-built omnichannel digital solutions that offer customers and employees of banks a transformative yet unified user experience across all customer touch points. Appzillon digital banking solutions are powered by Appzillon digital platform; an award-winning low-code development platform that facilitates rapid app development while ensuring future readiness at all times. With offices in India, Singapore, the UAE, and the US, i-exceed serves over 55 customers worldwide. Clonect: Clonect Solutions is an IT solutions company incorporated in 2014 with an aim to provide innovative solutions for the GRC challenges faced in the organizations by simplifying and automating the processes. It helps organisations to leverage technology optimally and innovatively, addressing GRC, GST as well as other finance IT solution needs. Within a short span of three years of its existence, Clonect had rolled out three major products in the GRC segment, in the previous year it also entered the GST segment with a roll out of its GST Compliance Software. Currently, Clonect in its portfolio has 70+ reputed enterprise clients with each of them having multiple group companies ranging from five to 120 in number. The flagship product for Clonect happens to be the first product rolled out by it – the Compliance Management Software (CMS) for which it aims to improve both technologically as well as through its content and be a market leader in the GRC and GST segment. KrypC: KrypC is a differentiated blockchain platform and solutions company which aims to accelerate the adoption of blockchain-based applications for enterprises. KrypCore, KrypC’s platform, abstracts the complexities and nuances of blockchain protocols; and its studio enables non-technical folks to configure their business process and workflows which are transformed into relevant Blockchain code, smart contracts, node deployment etc. KrypCore is a protocol agnostic platform and supports HyperLedger, Ethereum and Multichain. The team, with its presence globally in the US, the Netherlands and India, enables blockchain adoption across various industries and has enabled enterprises with production level blockchain solution adoption in the areas of insurance, microfinance and banking and looks forward to implementing more such solutions. Ace Turtle: Ace Turtle is a technology-driven platform company that provides direct-to-consumer web commerce solutions for leading retail brands. Its proprietary platform integrates online and offline retail channels to automate and optimize omnichannel fulfilment and provides brands with a single view of inventory and a single view of customers. The startup helps reduce the cost and complexity of omnichannel transformation for brands by using their existing framework and systems. Ace Turtle solutions are currently used by brands such as Fossil, Puma. Ray-Ban, Max, Arrow, Flying Machine, Ed Hardy and US Polo amongst others. Ace Turtle omnichannel platform comprises of technology, logistics and customer support and enables brands to improve the web commerce experience for their customer. The startup is backed by Singapore-based Vertex Ventures the venture arm of Temasek Holdings and C31 Ventures, the venture arm of CaptaLand. We have offices located in India and Singapore. MintM: MintM is a robotic platform which helps create frictionless customer experience by empowering ordinary devices like signage, kiosks and cameras. Driven by AI, MintM BOTs can recognize customers and objects to make things frictionless such as visitor management, customer loyalty, product discovery and personalized promotions. Started in 2014, MintM has been funded and accelerated by Microsoft. MintM has won several awards including London Business School, Tie Silicon Valley and Nasscom Emerge 50. The startup is working with several large companies with its BOTs deployed in more than six countries, claims the company. Kata.ai: Kata.ai is the first and leading AI startup in Indonesia that builds natural language understanding of Bahasa Indonesia. The startup has been founded by ex-Silicon Valley engineers who used to work at Google Deepmind, IBM Watson, VMware, Airbus and tech companies in Hamburg, Tokyo, London and Paris. Kata.ai’s Natural Language Processing (NLP) technology powers multi-purpose chatbots (virtual customer service / virtual friend) for major corporations in Indonesia across a different kind of industries such as, Unilever (FMCG), Telkomsel (Telco), Bank BRI (Financial Services), and Alfamart (Retail). The company’s proprietary Kata Bot Platform can be leveraged to create feature-rich chatbots on top of Kata.ai’s robust and scalable AI technology platform, ensuring company of any size can easily build their own chatbot on any messaging platform. With this platform, it is now possible for the business to focus on designing engaging interaction for their customers, while Kata.ai handles all the technical aspects of the chatbots. Established in 2015, the company has become a trusted partner for major corporations such as Microsoft, Accenture, and Line. In 2017, the company also received Series-A funding led by Trans-Pacific Technology Fund. Liv.ai: Liv.ai is a deep learning and artificial intelligence based speech recognition and natural language tool for Indian languages. Liv.ai’s aims to enable a billion Indians to communicate with their devices, businesses and government in their own language. The startup has developed breakthrough speech recognition technology in nine Indian languages besides English. This speech recognition technology picks up most accents and is adept at cutting out background noise as well. Liv.ai’s Speech APIs are being used by hundreds of developers and the company has found success with enterprise clients across multiple domains. VideoKen: Videoken is a AI-based continuous learning platform that helps organizations effectively utilize freely available videos on virtually any topic, and curate quality engaging learning content. With its paented solution, VideoKen’s customers have been able to put together learning content over three times faster, with higher quality and lower costs, claims the startup. The startup enables self-learning and peer-to-peer learning, leading to greater learner engagement and increased productivity. VideoKen’s customers include large global enterprise, small and medium organizations and educational institutions. VideoKen was founded in January 2017 by Dr. Manish Gupta, the former VP and Director at Xerox Research India, Ashish Vikram, a former VP at Flipkart and subsequently joined by Vishnu Raned, former VP of Asia-Pacific & Japan at Zend Technologies. VideoKen is headquartered in Princeton, New Jersey, with a R&D lab in Bangalore, India. VideoKen has raised seed funding from a consortium of angel investors including LG Chandrasekhar, chairman of Sutures India, Sashi Reddi, partner at US based SRI Capital LLC, and some former and current executives of Flipkart. Docswallet: Docswallet (formerly MyEasydocs) web application is a digital document vault, wherein digitally certified documents can be stored and shared for visa applications, employment, higher studies, trade application etc. Docwallet eliminates the exchange of paper and creates trust on digital documents between organisations and individuals. A large number of universities and other organizations in India have already adopted DocsWallet. Docswallet uses blockchain technology to provide digital locker services. MegDap: Megdap Innovation Labs has been founded by two ex-Microsofties Meghashyam Karanam and Pradeep Parappil with an aim to bridge the digital divide by creating an ecosystem for business that blends local relevance with a sustainable business model for all stakeholders. The focus is to bring the collective power of technology, language & business to a global non-English speaking audience. 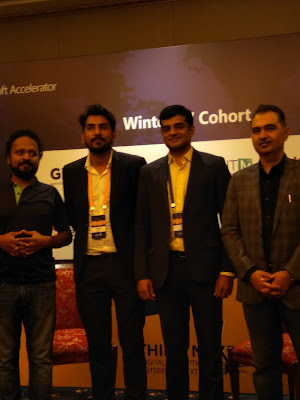 Megdap is a part of Barclays, Microsoft and Reliance GenNext Accelerator program. The startup is also a part of Kerala Startup Mission. MegDap has built a highly scalable cloud based AI Platform for Languages – TexLang, Through the use of technology, TexLang is addressing the language technology demands of large enterprise customers. GIEOM: GIEOM is an award winning software product company providing solutions to banks for change management, regulatory compliance and knowledge management. Catering to 38 banks across Africa, Middle east, Europe, USA and India, the company offers a unique business visualization technology with Intelligent linking that monitors, controls and optimizes Operations while reducing risk and increasing compliance. Additional benefits include better Customer service and increased employee satisfaction. Simplilearn has helped more than 500K professionals and companies across 150+ countries get trained, acquire certifications and upskill employees. Simplilearn provides outcome-centric training courses relevant for the digital economy in domains such as Digital Marketing, Big Data and Data Science, Cloud Computing, Cyber Security, Mobile App Development, IT Services and Architecture, Agile & Scrum, and more. The courses are delivered through online self-learning and instructor-led virtual classrooms and are supplemented with live projects and global teaching assistance.